The number of European patent filings grew again in 2015 reaching a new high of nearly 279 000 (in 2014: 274 000, +1.6%). The figure is an indicator of the growing demand for patent protection from businesses worldwide. The EPO's 2015 annual report, published today, also shows that the number of European patent applications (files for which applicants have actually requested a European patent at the EPO) rose to 160 000 last year (in 2014: 152 700, +4.8%). This increase was fuelled mainly by companies from the US (+16.4%) and China (+22.2%). The volume of applications originating from the 38 EPO member states remained almost stable last year (+0.7%). In addition to the innovative capacity of US businesses, the strong growth in applications from the United States is also due to the effects of a change in US patent law. The top five countries of origin for European patent applications in 2015 were the US, Germany, Japan, France and the Netherlands. "The remarkable growth in patent applications at the EPO proves that Europe continues to be a hub for innovators from all over the world, and an attractive technology market," said EPO President Benoît Battistelli. 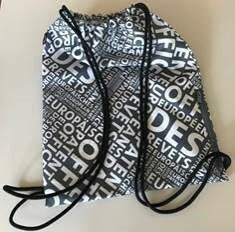 "It reflects the interest of businesses and inventors in opting for high-quality patent protection for the European market." He added: "Despite the impressive growth in applications from outside Europe, the balance of the number of patent applications made by European companies in other regions remains clearly positive, which underlines the innovative potential of the European economy." There were marked differences in patenting activity among European countries in 2015: Italy reversed the negative trend of the past four years (with +9.0% more applications in 2015 from Italian companies than in 2014), as did Spain (+3.8% over 2014). Meanwhile, Belgium (+5.9% over 2014), the UK (+5.7%), the Netherlands (+3.3%) and Switzerland (+2.6%) all continued their growth. Other countries including France (+1.6%), Austria (+1.4%) and Sweden (-0.9%) remained more or less at the level of the previous year, while applications from Germany dropped again (-3.2%), and some Nordic states such as Finland (-8.3%) and Denmark (-2.7%) also had fewer applications. Among the countries with smaller application volumes, there were strong increases from Poland (+17.8%), Turkey (+10.9%), the Czech Republic (+27.5%), Portugal (+21.2%), and Lithuania (+62.5%). Medical technology was once again the field with the highest number of patent applications at the EPO in 2015, growing by a further 11% over 2014. Other areas which showed significant growth were "Engines, pumps and turbines" (+18%) (where many patent applications in clean energies are filed), "Pharmaceuticals" (+10%), "Measurement" (+8%) and "Computers" (+8%). Several important sectors of technology saw fewer applications from European companies, including "Digital communication" (EPO countries dropping by -12% over 2014, compared with the field's overall growth of +3%), "Biotechnology" (-6% for EPO countries compared to +5% overall), and "Electrical machinery, apparatus and energy" (-5% for Europe; -2% overall). But European businesses filed the most applications in 8 of the 10 top technical fields (only "Medical technology" and "Computers" were dominated by US firms), demonstrating their broad patent portfolio. Europe led in a wide range of technologies: Dutch company Philips was top applicant at the EPO in three areas ("Medical technology", "Electrical machinery, apparatus, energy" and "Measurement"); Germany's Bayer was no. 1 in "Organic fine chemistry"; and Dutch-based multinational DSM had the most patent applications in "Biotechnology". Philips moved into the top spot in the list of companies with the most patent applications at the EPO in 2015. Samsung ranked second, followed by LG, Huawei and Siemens. The top 10 was made up of four companies from Europe, three from the US, two from Korea and one from China. With four companies in the top 20, Japanese enterprises also figure prominently among the largest applicants at the EPO. Europe's potential in terms of innovation and technology is also highlighted by the number of European patent applications filed relative to the country's population. Switzerland again topped the ranking in 2015, with 873 applications per million inhabitants. Second and third place went to the Netherlands (419) and Sweden (392), followed by Finland (365) and Denmark (346). The first non-European country was again Japan in ninth place (169). The increase in patent applications comes as Europe prepares for a major reform of its patent system with the arrival of the unitary patent, which will apply across almost all EU states and also establishes a centralised court for patents, the Unified Patent Court (UPC). Once in place, the unitary patent, which will be delivered and administered by the EPO, is expected to bring substantial time and cost savings for businesses wishing to legally protect their inventions EU-wide. All of the preparations on the new system were completed in 2015, and the EPO is now ready to deliver unitary patents. Four more EU member states, including Germany and the UK, have to ratify the UPC agreement for the system to become a reality. 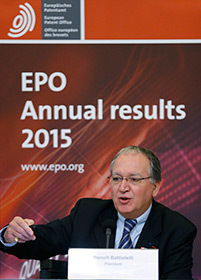 The EPO remains confident that the necessary ratifications can still be concluded in 2016. In response to the continued growth in demand for patent protection in Europe, the EPO has taken significant steps in the past few years to modernise its internal structures and increase efficiency, while further improving its patent quality. These cover such diverse areas as cooperation with the member states, the EPO's IT infrastructure and human resources policy. The 2015 annual results show that the reforms are paying off: The number of products (such as searches and examinations) delivered by EPO patent examiners grew by 14% in 2015 to 365 000; and the EPO published more than 68 000 granted patents, an increase of nearly 6% over 2014, and the highest number ever. Our grant process continues to be very rigourous, with only 48% of the applications filed becoming a European patent. In the past year the territory covered by European patents also grew further to include countries outside Europe. Morocco became the first non-member country of the European Patent Organisation to validate the legal effects of a European patent on its territory when its validation agreement with the EPO came into force on 1 March 2015. The Republic of Moldova followed with its validation agreement entering into force on 1 November 2015. This shows the attractiveness of the European patent system, and has brought to 42 the number of countries for which patent protection can be obtained simultaneously with a single European patent application.